With Tax Day Upon Us, Is Your Financial House In Order? 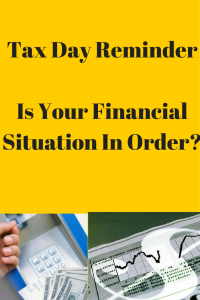 You are here: Home / Chapter 7 Bankruptcy / With Tax Day Upon Us, Is Your Financial House In Order? April 15 is not only tax day, but it’s a great day to look at your financial situation to see if you need to make any adjustments. This is the time when you can analyze how you did financially in the past year. This is the time when you’re required to have your income tax prepared, filed and paid. In some cases, you could ask for an extension. However, even with an extension, you are required to pay the tax that is due and owing as of April 15. This is also a great time to see whether or not your budget is falling in line with your desires. In other words, are you making ends meet or are you struggling or even falling behind? If you are falling behind on your bills and you are not able to make ends meet, you may want to consider filing chapter 7 bankruptcy to get a fresh start. Chapter 7 will allow you to eliminate miscellaneous unsecured debt such as medical bills, credit card bills, personal loans, utility bills and other debt. There are some debts that are not eliminated in a chapter 7 such as student loans, recent taxes, parking tickets, child support, maintenance payments and debts incurred through fraud. Additionally, you may want to consider working on a budget at this time. You want to take the next month or two and determine exactly what you spend each month and what you earn each month. By looking at a two-month stretch of time, you will be in a greater position to understand whether or not you are in the positive or in the negative. If you have assets and you do not want to lose those assets, you may want to consider filing chapter 13 bankruptcy. Chapter 13 will allow you to reorganize your debt over the next 3 to 5 years. You are able to save a home that is in foreclosure provided the home has not gone to a Sheriff sale yet. You are also able to reorganize the debt on a vehicle by making likely a smaller payment through a chapter 13 trustee over a five-year period. I would take a few moments today to ponder your financial picture. This reminder of April 15, tax day, is a great time to actually look at your total financial situation to determine where you are. Are you doing well? Are you falling behind? Do you need assistance under federal bankruptcy laws. If you need further assistance, more information is available at 847-520-8100. I would be happy to discuss your financial situation without charge to determine whether or not you can be helped under the existing laws.